There are three main nutrient groups found in food: carbohydrates, proteins and fats. When we eat, our bodies convert each of these into usable energy that is measured in calories. Learning how to count calories in your daily diet is an essential step when trying to maintain a healthy weight or lose excess weight. BMR is an acronym that stands for basal metabolic rate. This is a measure of the amount of calories that your body consumes while at rest and not doing anything. BMR can be calculated online or by following the formulas for both men and women. If you are trying to maintain your weight, you would take your BMR and multiply it by the appropriate number below based on your activity level. This will help you figure out the number of calories you can eat per day while maintaining your current weight. This is referred to as your daily calorie intake. Here’s an example to better display this data. Let’s say that your BMR is 1,790 and you are also moderately active, exercising anywhere from three to five times per week. Your equation to figure out your suggested daily calorie intake would be: 1,790x1.55= 2774.5. You would need to stay at or under 2,774.5 calories per day in order to lose weight or maintain a healthy weight. Many people find that using a computer spreadsheet program makes this process easier. Record what you eat in a day in a food journal (great motivation when your goal is fat loss!). Type that information into your spreadsheet at the end of the day and total up your calories. Writing this data down helps keep you on track while also serving as a helpful wake-up call so you can see the caloric factor of the foods you eat most frequently (the foods that have the greatest impact on your weight). 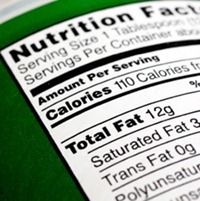 When shopping for food, be sure to check the calorie content of your food items before you buy them. Breads, snacks, frozen foods, packaged items and etc. need to be checked for amounts of calories per serving. Choose items that are lower in calories and be sure to separate your foods into their designated serving sizes. If something says 100 calories per serving, but the box has 4 servings in it, you’re really eating 400 calories if you eat the whole box instead of just the serving size. Not all packaging will show total numbers on calories, but many websites provide that information on a wide variety of food items. Be sure that whatever serving size you check the calories for online is the same amount as what you are eating. To keep serving sizes exact, use measuring cups and spoons. You will be able to better keep track of your total calorie intake for the day this way. You can count calories in food on your own, but it is more difficult to accurately count calories this way. There are ways to roughly figure out how many calories per serving are in the food that you eat. The table below shows the average calories in carbohydrates, proteins, fats, and alcohol. Fiber contains carbohydrates that are not digestible, so you can subtract them from the amount of total carbohydrates. Counting calories won’t be so easy because you won’t have the best handle on estimating a food’s calorie values. After a few weeks you should settle into the process and become a pro at it. So be patient. When you’re just starting out you won’t know the number of calories in any food item, so counting calories will require some time and research on your part. As you learn, you will get to the point where you automatically know that an apple is 70 calories or your favorite granola bar is 90 calories. Don’t expect to lose all of your excess weight overnight. Those of us with the best intentions are easily discouraged just before seeing real results. Keep your faith a bit longer and you will see changes and reap the rewards of hard work. Stick with your program, believe you can do it and be patient with the process. You owe this to yourself and your health. For your general health you need a balance of carbohydrates, proteins and fats in your diet. The basic guidelines are 60% of calories from carbohydrates, 30% from fats and 10% from proteins. It’s important to have a target goal for your daily calories to make it easier when deciding what to eat. Remember, 1 pound equals 3,500 calories. Cutting out 500 calories per day will add up to 1 pound a week.